When I started working at Center for Health Progress a few years ago, I was told we were thinking about creating a graphic novel as a tool to discuss the root causes of health inequities. My initial reaction was skepticism, because it’s such an unusual medium and the topic is so complex. But as we developed the characters, wrote the script, and the story came to life visually, I started to see its potential. After it was complete, I facilitated several discussions around the state using it, and that solidified my faith in this project. As we approach the one-year anniversary of the release of our award-winning graphic novel, Waiting for Health Equity, I’ve been reflecting on all it’s accomplished in just one short year. The graphic novel aims to start new conversations about the complex challenges Colorado faces in working toward health equity. In each chapter, we meet a new character and learn about the challenges that they face in their personal lives as a direct result of the systemic injustices and oppressive policies that plague our institutions. And, it certainly started some new conversations across Colorado! 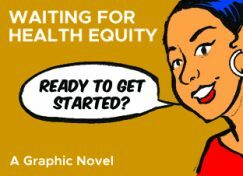 After its full release in April, Center for Health Progress began conducting presentations around health equity, using the graphic novel as the anchor for the conversation. Since then, we have presented 14 times to nearly 400 attendees, and the graphic novel has been read nearly 8,000 times. The audiences have included hospital and health system executives, students, public health professionals, providers, community members, health care advocates, legislators, and many others. We love having truly meaningful conversations with so many of you. The discussions that arise from these facilitated presentations are the most fruitful component—colleagues sharing their most personal stories with each other about their own experiences with racism or immigration, their questions for each other to help build empathy and understanding, and their insights and connections into how they can take action to dismantle structural inequities in their work and everyday lives. We’ve had physicians place immediate calls to their HR department with ideas for changing hiring practices, program managers brainstorm new equity projects on the spot, and general relief that there is finally space and time for honest conversations about what people have seen, heard, and experienced. And, with our pre- and post-testing from these conversations, we can see that participants leave more confident in their understanding of health equity and ready to take action. Just like the rest of the country, Colorado has a long, well-documented history of oppressive policies and practices that disadvantage some groups over others, leading to unjust differences in health. The root causes of these health inequities are economic, social, and racial injustices that are embedded in our society. At Center for Health Progress, we are using Waiting for Health Equity to start conversations that will move towards action on these issues. While a graphic novel might not be the first approach you’d think of to start that conversation, its stories, data, and historical perspectives have opened up a robust dialogue about the complex nature of health equity, and we are grateful to be a part of it. If you haven’t already started these conversations at your organization or in your life, we encourage you to do so, and keep them going! Need help getting started? Talk to us about bringing Waiting for Health Equity to your group or organization. Contact Sarah McAfee at sarah.mcafee@centerforhealthprogress.org.